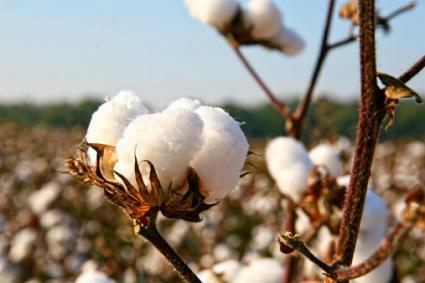 Cotton plants are native to several parts of the world, and the use of cotton fiber originated independently at least 7,000 years ago in both the India/Pakistan and the Mexico/Peru regions. One of the oldest extant cotton textiles dates to about 3000 B.C.E. Because cotton plants cannot be grown in cooler locales such as northern Europe, climate was an important limiting factor in the spread of cotton cultivation. Cotton textiles were traded widely in Roman times, and the growing and production of cotton soon spread from India to Egypt and China. Cotton production did not begin in Greece until C.E. 200 or in Spain until tenth century C.E. By the thirteenth century, though, Barcelona was a thriving cotton industry center specializing in producing cotton canvas for sails. England began using imported cotton in the thirteenth century. Widespread use began in the seventeenth century when significant quantities of raw fiber began to be imported to Great Britain from the expanding British colonies for processing and weaving into cloth. Cotton textiles were widely used in pre-Columbian Meso-American and Andean civilizations. With the beginning of European colonization of the Americas, cotton originating in Mexico and Peru began to be cultivated wherever climate and soil were suitable. Cotton became an established crop in many parts of the American South, and later spread into the regions now known as Texas, Arizona, and California. Cotton also became an important global trade commodity. For example, England exchanged American cotton fiber for Indian and Egyptian cotton textiles. Among these trade goods, the finest cotton textiles were from long, fine staple cotton fiber. In fact, Indian prints and gauze cottons surpassed the popularity of fine woolens in the seventeenth century and played a role in greatly diminishing the demand for wool and tapestry textiles. The cotton trade figured in the American War for Independence, as the British struggled to hold onto their source of raw fiber. Cotton production also played a controversial role in the slave trade; cotton, produced by slaves in America, was among the trade goods used to obtain other slaves in Africa. The emphasis on hand labor in cotton production increased the demand for slave labor at the same time that slave labor became ethically intolerable to many Americans (Parker 1998). The plantation system that was at the heart of cotton production thus was an issue in the controversies and regional disputes that led to the American Civil War. With the invention of the cotton gin in 1793, cotton became a much higher volume commodity, as the machine took over one of the most laborious steps in cotton production, the separation of fibers from seeds. The cotton gin thus was a key component in the development of the U.S. textile and apparel industry. By 1859, twothirds of the world production of cotton fiber came from the United States (Parker 1998). Meanwhile, immigrants from Europe brought with them the knowledge and the technology to establish textile production in the United States. Using available water power to drive spinning and weaving machinery, New England became the center of the early textile industry. During the Civil War, a severe reduction in cotton fiber available from the American South led the British industry to seek other sources for cotton fiber and thus expanded cotton production globally. In the United States, both the production of cotton fiber and its processing into cloth continued to evolve according to changing economic circumstances. Between World Wars I and II, a majority of the U.S. textile mills relocated from the Northeast to the South and fiber production expanded in Texas and California. At the beginning of the twentieth century, cotton production was led by China, the United States, Russia, India, Pakistan, Brazil, and Turkey. Cotton fiber had become an important economic force in as many as eighty countries worldwide. Cotton remains the most important fiber in apparel with nearly half of the world demand for apparel fibers traceable to cotton and cotton blends. 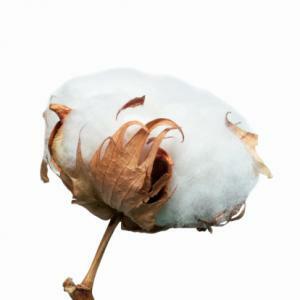 Cotton fiber is a seed hair removed from the boll (seed pod) of the cotton plant that bursts open when fully developed. Bolls emerge from blossoms that fall off to leave the exposed boll. One boll can produce more than 250,000 individual fibers. The cotton plant is a four- to six-foot tall shrubby annual in temperate climates, but a treelike perennial in tropical climates. The best qualities of cotton grow in climates with high rainfall in the growing season and a dry, warm picking season. Very warm, dry climates in which irrigation substitutes for rainfall, such as Arizona and Uzbekistan, are also well suited to cotton production. Rain or strong wind can cause damage to opened bolls. Cotton is subject to damage from the boll weevil, bollworm, and other insects as well as several diseases. Application of insecticides and development of dis- ease-resistant varieties have helped achieve production goals for cotton. Recent innovations in organic cotton and genetically colored cottons continue the progression of putting science into the production process. Processing cotton includes many stages. While picking mature cotton bolls by hand yields the highest quality, mechanized picking makes high production more feasible and affordable. In many countries where hand labor is more affordable than equipment, cotton continues to be hand-picked. Ginning is used to clean debris from cotton and prepare it for spinning into yarn. Grading separates cotton into quality levels in which short fibers tend to correspond to coarse and long fibers to make very fine quality textiles. Carding is the next step in all cotton fiber processing and is used to further clean and minimally align fibers. An additional processing called combing is used to further clean and align higher quality cottons. Yarn creation involves drawing fibers into a thinner strand that is then spun into a finished yarn ready for fabrication into the textile. So-called greige-good (unfinished) fabrics undergo final finishing, which typically involves singing (burning off loose particles) and then tentering to align the grain of the fabric and adjust the width. Either at the fiber, yarn, fabric, or product stage, cotton may be subject to bleaching to remove natural colors (tan through gray) at which point fashionable colors can be added through dyeing and printing processes. Other final finishing processes might be used to obtain special features such as sizing for smoothness; durable press; a polished surface; or a puckered surface texture. Cotton fiber varies in length from as little as ⅛-inch linters that are not useable as fiber up to ultrafine long staple cottons of 2½ inches. Short staple fibers (¾-1 inch) are used for relatively coarse textiles like bagging; medium to long staple (1-1⅜ inches) are the Upland cottons used for a majority of cotton products; and extra long staple (1⅜-2½ inches) cottons labeled as Egyptian, pima, Supima, sea island, and Peruvian cottons are used for very high quality exclusive cotton goods. Many are hand picked to achieve top quality. Natural colors for cotton fibers include off-white, cream, and gray; selective breeding of naturally colored cottons has expanded the color range to include brown, rust, red, beige, and green. Higher quality, long staple cottons are closer to white than coarse shorter fibers. But regardless of natural color, bleaching is required to produce white or pure colors. Cotton fiber is a flat, twisted, ribbon-like structure easily identified under the microscope. This characteristic can be somewhat modified by finishing fiber or fabric with sodium hydroxide (caustic soda) or liquid ammonia and thereby swelling the fiber. This rounder mercerized or ammoniated fiber is more lustrous and stronger than typical cotton. It also accepts dye better than untreated cotton. Applying this treatment in a pattern yields plissé, a puckered textured surface effect quite unlike the typical cotton fabric surface, which is flat, slightly wrinkled, and somewhat dull. Long-staple fine cottons exceed this standard and are often hard to differentiate from silk in surface smoothness. Cotton tends to be neutral on the skin, so is considered a comfortable fiber for everyday wear. Cotton is cellulosic and thus has aesthetic, comfort, and performance characteristics reminiscent of linen and rayon textiles. These include high absorbency and low insulation and a tendency to be cool in hot temperatures. Cotton does not dry as quickly as linen and silk. As a relatively heavy textile, cotton is more useful for keeping cool or for dressing in layers than it is in providing warmth. Cotton is subject to linting, that is, the shedding of fibers that can result in bits of fiber lying on the surface of the textile. Cotton is also somewhat subject to abrasion and will become thin or develop holes in areas of recurring abrasion. Highly bleached cotton textiles have lower strength and durability than those that retain natural color. Cotton fibers resist absorbing dyes and fade easily in sunlight and from abrasion. Therefore the "faded" effect commonly found among fashionable cotton fabrics since the 1970s optimizes cotton's natural character. Cotton is a medium strong fiber with a tendency to wrinkle. Wrinkling is diminished when fibers are long and fine and yarns are flexible. Wrinkle resistant finishes can help overcome lack of resiliency. 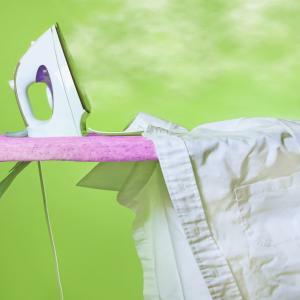 Blending cotton with synthetic fibers such as polyester is the most common way to overcome wrinkling. This solution without careful attention to yarn quality can lead to pilling as short cotton fibers break off and synthetic fibers hold onto the broken fibers. The twisted cotton fiber results naturally in a somewhat fuzzy spun yarn that holds onto dirt particles. Water- and oil-borne staining is also commonplace due to high absorbency. Cotton has high heat resistance, is stronger wet than dry, and withstands cleaning, pressing, and creasing very successfully. 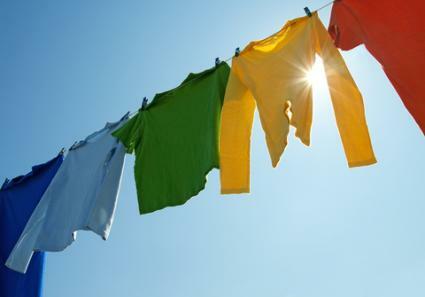 Cotton is resistant to most cleaning detergents but damaged by acid such as air pollutants. Cotton shrinks back to original dimensions when wet and thus experiences relaxation shrinkage. Because it can be sterilized by boiling, cotton is useful in clean room and medical applications. Cotton seldom irritates the skin or causes allergies. Cotton textiles are flammable and subject to damage by mildew, perspiration, bleach, and silverfish. Cotton holds a unique place in history, evolving from being more highly valued than silk and wool in the sixteenth and seventeenth centuries to becoming an everyday, comfort-oriented textile in contemporary apparel worldwide. Early Indian cottons were so ultra-fine that they were extremely valuable as trade goods and were highly competitive with fine woolen and silk textiles of the era. Cotton was originally available only to the wealthy due to the intensive hand labor needed to process fiber into yarns. In the early nineteenth century, wool held nearly 80 percent of world market share, with cotton and linen taking second and third place. However, by the early twentieth century, cotton became and remains in the early 2000s the leading apparel fiber worldwide. Liberty cottons are an example of the continued success of cotton as a prestige fabric; they have remained a trademark for the very finest Egyptian long staple cottons since 1875 when Liberty of London began copying Indian cotton prints onto ultra-fine long staple cottons. The advent of synthetic fibers proved strong competition for cotton in the 1970s, but cotton production rebounded as comfort became more important to many consumers than price. Faded cotton is an example of the power of the "comfort" aesthetic. Every decade since the 1970s has returned faded cotton to current fashion. While synthetic fibers can achieve the aesthetics of cotton, they only very recently came close to both the feel and the comfort of cotton with the advent of microfiber polyester. The widespread adoption of "casual Friday" dress codes by much of corporate America in the 1990s continued to make cotton an important element in the fashion aesthetic. Cotton has also achieved a good reputation as a "green" textile, because it is biodegradable. Cotton is highly valued for comfort and launderability. It is highly tolerant of heavy use. Wordwide, approximately 50 percent of apparel is made of cotton fiber, but pure cotton products are not as prevalent as cotton blends. In apparel, 100 percent cotton cloth is preferred for uses that demand being next to the skin or high physical activity. This includes a wide range of activewear that focuses on jersey, interlock, and sweatshirt knitwear for the upper body and woven textiles such as denim and khaki for the lower body. Apparel for situations where appearance is more important than comfort in physical activity is frequently made from cotton blends. About 60 percent of all interior textiles (excluding floor coverings) are made of cotton or cotton blends; this category includes sheets, towels, blankets, draperies, curtains, upholstery, slipcovers, rugs, and wall coverings. In many of these applications, cotton's natural character is aesthetically pleasing, but performance characteristics such as high absorbency and tendency to soil are not advantageous. Manufacturers combat this tendency with stain-resistant finishes and often try to achieve the aesthetic qualities of cotton in cotton-synthetic blends. Industrial uses account for less than 10 percent of cotton production, reflecting the advantages of synthetics for industrial applications requiring strength and durability. Cotton is preferred for many medical uses because it can easily be sterilized, is highly absorbent, and does not retain static electricity. See also Fibers; Textiles and International Trade. Collier, B., and P. Tortora. Understanding Textiles. New York: Macmillan Publishing, 2000. Hatch, K. Textile Science. Minneapolis, Minn.: West Publishing, 1993. Kadolph, S., and A. Langford. Textiles. 9th ed. New York: Prentice-Hall, 2002. Parker, J. All about Cotton. Seattle, Wash.: Rain City Publishing, 1998.